Between running influencer programs and checking out the newest Instagram features, social media marketers in 2018 had a lot to handle. Take a moment to reflect on this past year’s successes and losses. Which campaigns and content types fell flat? What could you do better at in 2019? As 2018 comes to a close, let’s take a look at what you should prioritize in 2019 and what you should let go of. Augmented reality made a splash a few years ago with Snapchat’s lenses. Now that users can design their own with the Snapchat Lens Studio, augmented reality is more accessible than ever. While it’s still in its infancy, it’s worth keeping this technology in mind when researching new content ideas. If you have a product or experience that is difficult to describe, an immersive ad might just be the ticket for finding new leads. Imagine being a travel agency and showing potential travelers the views they might see. Or a furniture maker placing their newest couch in a room you can walk around in. 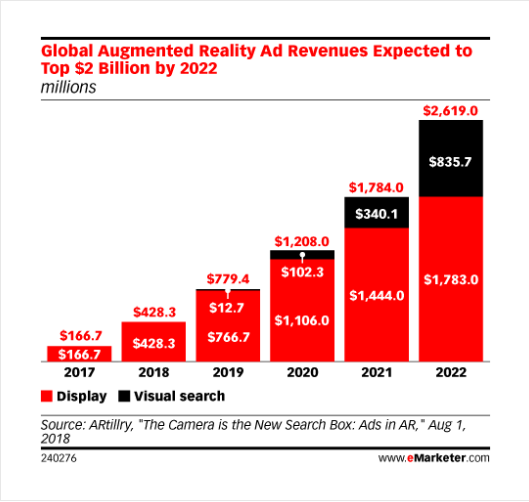 One 2018 study found that augmented reality ad revenues were expected to exceed $2 billion by 2022. These are projections to pay attention to if your advertising campaigns take a while to build. Augmented reality can be used for education, too. In addition to the beautiful photography and articles that National Geographic is known for, it tested out this 360º video experience to show off the hammerhead shark. Most people won’t be doing this in reality in their lifetime, but this video offers the chance to experience it without all the fear and potential environmental damage. But not by too much that it’s creepy. Where is the line? In 2018, we saw reports of social media networks misusing customer data and GDPR coming into play. Consumers learned about website cookies and what information they were sharing with companies. Going into 2019, personalized marketing may still be at the top of the strategy list, but to a tempered extent. It could be that you’ll see a Facebook ad after browsing a website’s page. Or that you’re wandering around a new part of town and are served an ad from a nearby cafe. Because the algorithms are constantly being adjusted against businesses, techniques like personalized marketing keep you at the forefront of a customer’s minds. Outside of advertising, though, there are still a few ways to personalize your marketing. For every Twitter user, you can open up Sprout and view the conversation history with them. This includes any Direct Messages, @Mentions and Retweets. If the user is a particularly chatty one, there’s space for internal notes. Having this history in place helps immensely in managing customer service. No longer will you need to keep asking what model phone they’re using if they told you just a few months ago. Direct Messages in Instagram and Facebook Messenger work in similar ways. These one-to-one conversations give a more personal experience to each user. Being able to deliver marketing messages tailored to the person is still worth more than a catch-all net. In a 2017 study by Accenture, 92% of US consumers believe companies need to safeguard their data. But 44% are frustrated when companies don’t deliver a customized and relevant experience. The conclusion? Inform consumers on what information is being collected and use the data to wisely enhance their experience. A seamless customer service experience has never been more important. Small businesses have the agility to resolve inquiries quickly with the right workflow in place. In the same Accenture study, customer expectations for emerging market providers were a whole 12 percentage points higher than for mature providers. These expectations include more digital options for service and support and specialized treatment for being a good customer. Being able to serve a good customer experience means integration among your sales and marketing efforts. On social media, that can look like having shoppable tags in Instagram or linking your customer service support to your social media channels. The Facebook Messenger web chat plugin shows up in the corner of your website, offering customers a way to directly chat with you about your products. This also goes back into the personalized marketing expectation. With the chat window, customers know that they’re talking to someone (unless, of course, it’s a Facebook bot). This is an opportunity to offer recommendations and soft sell on products. 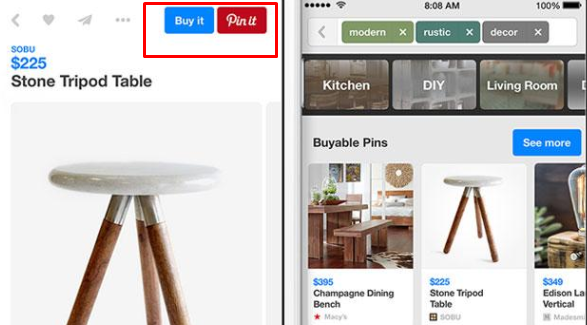 Pinterest is continuously evolving their platform. With similar image searches and personalized recommendations in their feed, Pinners use Pinterest to research and shop for ideas. Making sure your business is ready to sell on Pinterest is step one in reexamining your Pinterest profile. The next step is to consider investing in Pinterest Ads. For Promoted Pins, 61% of Pinners have made a purchase after seeing business content on the network. This is especially great news for image-oriented and lifestyle brands. Content on Pinterest has built up over the years and its image search functions have only improved. Want to plan for your upcoming dinner party? You can now narrow the search done by recipes, menus, tablescapes and more. Go into 2019 with a refreshed look on Pinterest and try out Promoted Pins. Even with the most agile and smallest of social media teams, written protocols and policies don’t hurt anyone. In fact, planning for the best and worst situations on social media help you avoid acting impulsively or based on your emotions during a challenging situation. Check in on your current policies and see what needs to be revised to reflect current trends. Take a look at our comprehensive guide on social media policies if you need to start from scratch. Some things to keep in mind are how quickly the news cycle moves, common responses you might have to customer concerns and conversations where you can make the most impact. 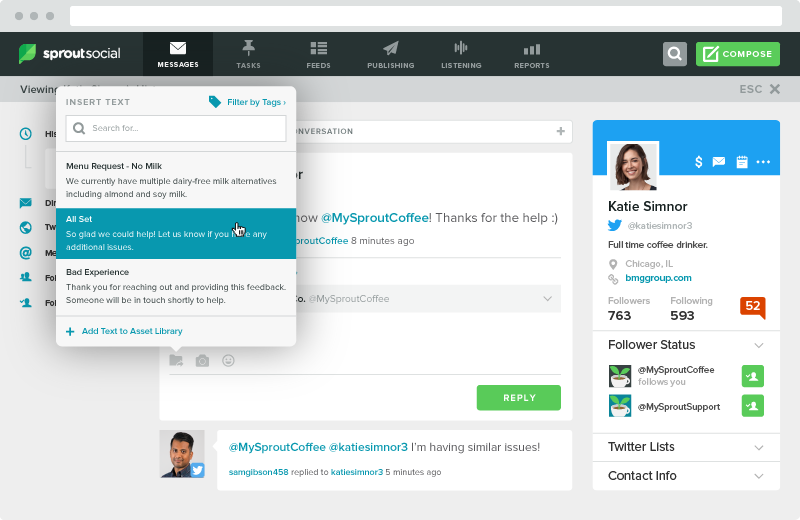 The saved replies feature in Sprout comes in handy when you have common customer concerns or complaints. This keeps your thinking at a minimum and the customer experience consistent. It also frees up your time so you’re no longer scrambling for the same replies. When you decide to comment on political and social issues depend entirely on your social media policy. For REI, the company cares deeply about environmental efforts, which means it was active in tracking the midterm election results. This leads us to our next checklist item. 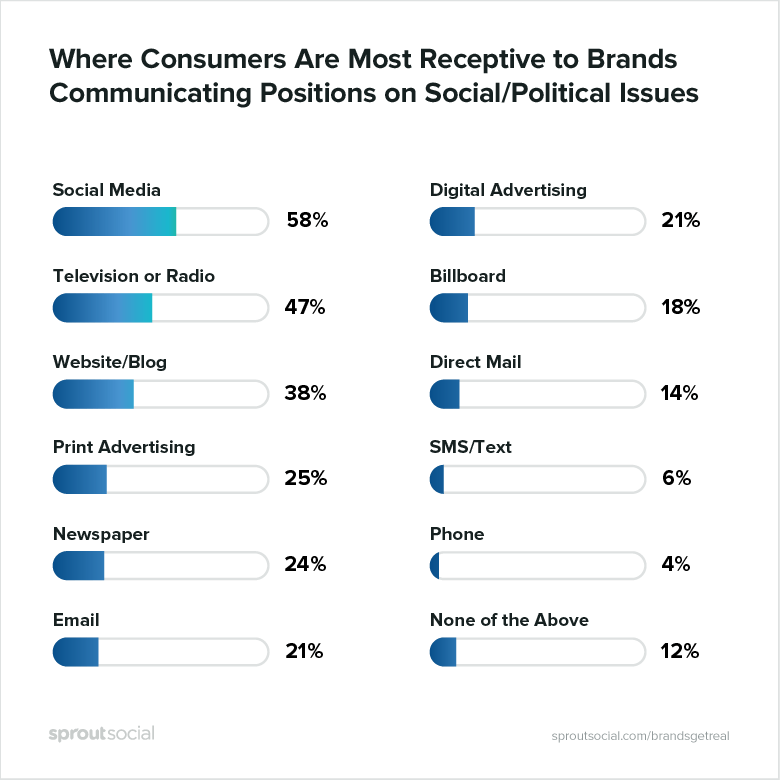 In Sprout’s Brands Get Real study, we found that consumers were most receptive to brands speaking out on social and political issues on social media. This, in turn, meant more benefit for brands. When a consumer agrees with a brand’s stance, 44% would purchase more, 52% would show greater brand loyalty and 35% would recommend it to their personal network. There is a line, though. The stances that the brand takes need to be relevant to the brand’s products or services, its customers and/or their its business operations. Your company’s values should already be established. But can you be more vocal about them? As you’re looking at your 2019 budget, let’s hope the social advertising numbers aren’t decreasing. More companies becoming present on social media and increasing their budget means that you need to do the same. And not only that, but there is a need for more creative advertising campaigns. 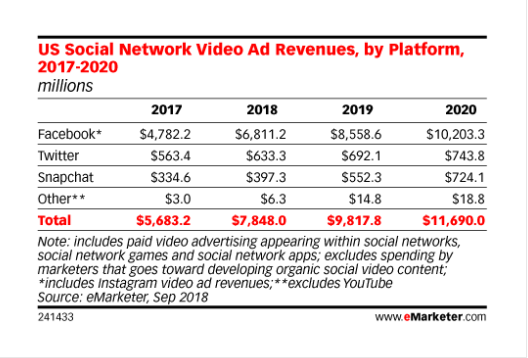 Video ads are expected to double in 2020 from 2017, according to eMarketer.com. This is a large jump and something to ask yourself is: are you ready? Do you have the video team and budget to execute your ads? The good news is that you are no longer limited to boosting posts in the Facebook feed. You have a wide range of advertising options available to you, from Instagram Stories ads to Pinterest Promoted Pins. Take some time in the new year to explore new ad content and types. In this same vein, look at how much you’re spending on content development. Are your ads up to par with your competitors? Do they stand out in a feed or blend in with everyone else? 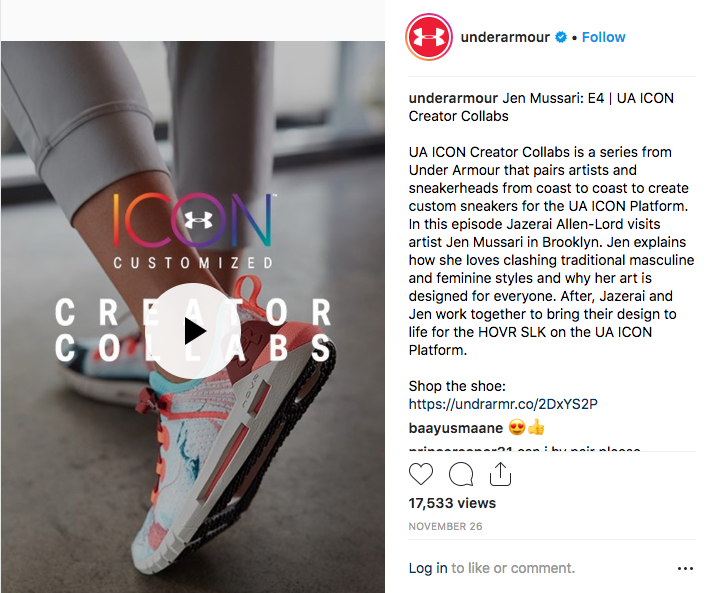 Maybe it’s time to consider implementing a brand partnership program like Under Armour has. The above partnership created content not just for the feed but also for their IGTV channel that spotlights their creator collaborations. Your social advertising budget needs to include both advertising costs and content creation costs. And don’t forget to leave some room for any new features that might arrive in 2019. 2019 looks to be a promising year for social media marketing. It certainly has challenging algorithms and more budget spends ahead but the landscape offers more opportunities for marketing and creative content. Social media is no longer a startup atmosphere. Instead, brands who plan ahead yet are flexible in their approach will win. We’d love to hear from you on Twitter: how will you be changing your strategy for 2019?